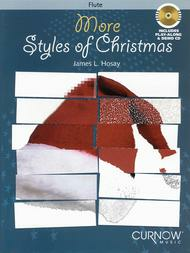 More Styles of Christmas (Intermediate Level Instrumental Play-Along Packs). Arranged by James Hosay. For Soprano Saxophone, Tenor Saxophone (Tenor Sax). Curnow Play-Along Book. Play Along. Softcover with CD. 20 pages. Curnow Music #CMP104305400. Published by Curnow Music (HL.44003271).ISBN 9043123080. Play Along. 8.75x12 inches.By popular demand, here are 12 more Christmas favorites for you to play along to in a wide assortment of styles. There are current styles like hip-hop, house, alternative rock, and zydeco, as well as a few retro styles like new age, new wave, and folk. The songs are traditional and well-known, and you'll have a blast playing along with the hip, current arrangements. Includes: God Rest You Merry Gentlemen, Away in a Manger, We Three Kings, I Heard the Bells on Christmas Day, Come All Ye Faithful, Silent Night, Hark! The Herald Angels Sing, O Come, O Come, Emmanuel, In the Bleak Midwinter, O Holy Night, and It Came Upon a Midnight Clear.